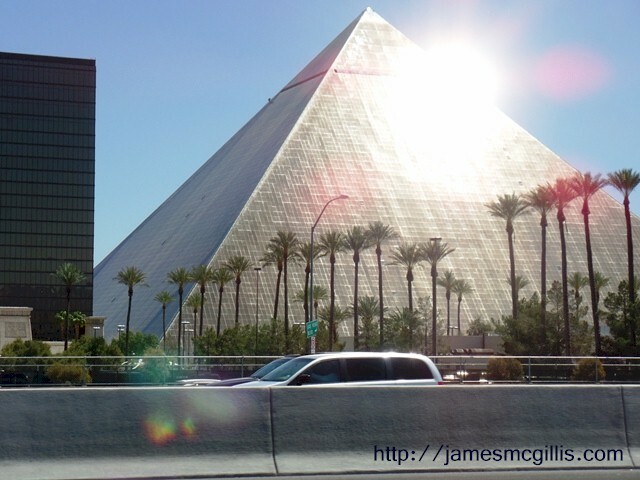 In April 2012, I continued my travel from Los Angeles to Mesquite, Nevada. Already that day, I had taken the Pearblossom Highway to Interstate I-15 North. After observing the new industrial desert at Ivanpah Valley, California, I crossed the state line at Primm, Nevada. Approaching Las Vegas, I had planned for a Las Vegas Freeway “drive by”. Since I was pulling my travel trailer that Thursday afternoon, a drive up Las Vegas Blvd. (The Strip) was out of the question. By the time I approached the city, with rush hour well underway, I took a deep breath and prepared to run the traffic gauntlet that is I-15 through Las Vegas. Until the 1970s, old U.S. Highway 91, Las Vegas Blvd. and The Strip were all the same road. In North Las Vegas, the intersection of Las Vegas Boulevard and Fremont Street was also the historic intersection with U.S. 93 (the Salt Lake Highway) and U.S. 95 (the Reno Highway). Other than at The Strip in Las Vegas and in tiny Mesquite to the north, 1967 marked the completion of I-15 in Nevada. Until the 1974 I-15 bypass of The Strip, however, old U.S. highway intersections Downtown were the nexus for all traffic entering or leaving the Las Vegas. Lost in Nevada history is why it took seven years to build less than five miles of freeway around The Strip. With I-15 truncated at either end of The Strip, the final off ramps connected directly to Las Vegas Blvd. In those days, The Strip was famous for offering every pleasure or vice known to humans. Some might call the freeway delay good marketing. Others might call it shortsighted to delay opening the last I-15 gap in Nevada. Whatever windfall Las Vegas experienced during the seven-year delay cannot compare to the unending drag that the strategy placed on the economic future of Las Vegas. The 1960’s and 1970’s were the heyday of Las Vegas, growing from a railroad and highway town to the premier international gambling destination. Money goes where it is comfortable and it is now six times more comfortable in Macau than it is on the Las Vegas Strip. In 2012, monthly gaming revenue figures for Las Vegas top out at $530 million. In Macau, a gambling-friendly enclave on the Chinese Mainland, April 2012 saw gaming revenues of $3.13. From today's perspective, a traffic noose tightened around twentieth century Las Vegas left it gridlocked and unprepared for twenty-first century revenue opportunities. When the I-15 Las Vegas bypass opened in 1974, it was already obsolete. By then, I-15 through Las Vegas should have been well into its first phase of widening and improvement. As a legacy of the old highway plan, I-15 North still makes a tight S-curve as it skirts Downtown. There, it utilizes a highway corridor designed to handle the traffic of the 1960’s. With its grimy bridges and tight turns, you know that you are on an old section of highway. As a consequence, for decades now, one of the few constants in Las Vegas culture is the rush hour traffic tie-up near Downtown on I-15 North. Despite every lane-addition that highway engineers could manage, at least twice going northbound, the two right-side lanes of the freeway must exit. After years of traffic frustration, local drivers jockey for any possible advantage. At first, they keep to the right and then jam their way back on to I-15 North at the last second. Uninitiated drivers find themselves either shunted off the freeway or forced to act like locals, bulling their way back into traffic. Either way, a weekday afternoon trip on I-15 North through Las Vegas is a guaranteed white-knuckle ride. From I-15 North, what once was a giant glass pyramid in the desert, the Luxor Hotel, now looks tiny and almost lost on the horizon. Now that I-15 carries far more traffic than The Strip, the latter has become an architectural showplace, beckoning to I-15 motorists. With ever grander and more iconic buildings, The Strip offers a welcoming message to harried freeway drivers. 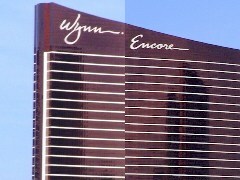 Nearing Downtown, buildings named Wynn, Encore and Trump, stand as high-rise monuments to outsized luxury and gaming revenue. With its combination of overheated traffic and fantastic architecture, a transit north on I-15 through Las Vegas reinforces it own self-image. I can almost see Frank Sinatra, his Rat Pack and the Mob in the 1960s deciding over drinks at the Sands Hotel that everyone should continue to drive The Strip.